April Fool’s!!! Our Clinic is Now Even More Cat-Friendly…Introducing the LICKI Brush! Home » April Fool’s!!! 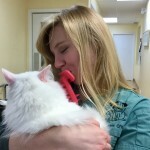 Our Clinic is Now Even More Cat-Friendly…Introducing the LICKI Brush! Here at Bloorcourt Veterinary Clinic, we are committed to transforming the vet experience for cats, turning visits into something stress-free…and even enjoyable! That’s why we are excited to announce that our cat appointments now feature the LICKI Brush! Many cats find vet visits a stressful experience. First they are put in their carrier, then they have to take a car trip or ride public transit…their day is often off to a nerve-wracking start before they even meet their vet. That’s why we start our appointments by building a relationship with our feline patients, and helping them feel more at ease. Using the LICKI Brush lets us interact with cats like a cat, and talk to them in their own language. And by starting our appointments with a soothing grooming session, we melt away the stress of getting to the vet, leaving our feline patients free to enjoy the rest of their visit. But don’t just take our word for it…we’ll let our patients tell you themselves!